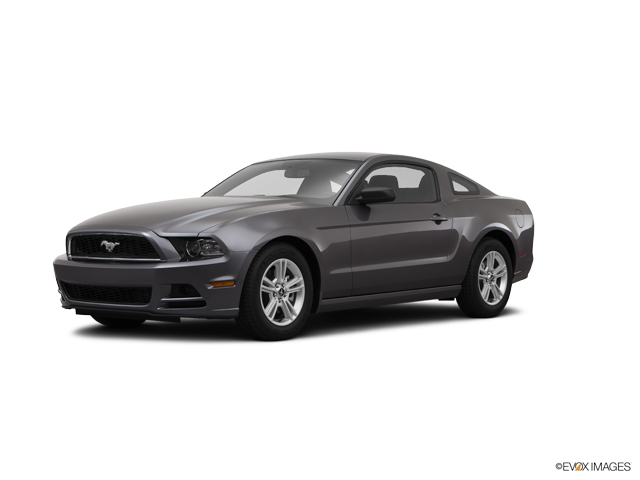 Look at this 2014 Ford Mustang V6 Premium. Its transmission and Regular Unleaded V-6 3.7 L/228 engine will keep you going. This Ford Mustang features the following options: Wheels: 17" x 7" Machined Aluminum -inc: painted pockets, Vinyl Door Trim Insert, Variable intermittent wipers, Trunk Rear Cargo Access, Trip computer, Transmission: 6-Speed Manual, Tires: P215/65R17 BSW AS, Systems Monitor, SYNC Communications & Entertainment System -inc: 911 Assist, VHR, SYNC Services, AppLink, Bluetooth, steering wheel controls, USB port and auxiliary input jack, and Strut Front Suspension w/Coil Springs. Stop by and visit us at Cavender Buick GMC West, 7400 West 1604 North, San Antonio, TX 78254. Look at this 2014 Ford Mustang V6. Its transmission and Regular Unleaded V-6 3.7 L/228 engine will keep you going. This Ford Mustang comes equipped with these options: Wheels: 17" x 7" Sparkle Silver Painted Aluminum, Variable intermittent wipers, Trunk Rear Cargo Access, Trip computer, Transmission: 6-Speed Manual, Tires: P215/65R17 BSW AS, Systems Monitor, Strut Front Suspension w/Coil Springs, Steel Spare Wheel, and Side Impact Beams. Stop by and visit us at Cavender Buick GMC West, 7400 West 1604 North, San Antonio, TX 78254. Check out this 2014 Ford Flex SEL. Its Automatic transmission and Regular Unleaded V-6 3.5 L/213 engine will keep you going. This Ford Flex has the following options: ENGINE: 3.5L TI-VCT V6 (STD), Wheels: 18" Painted Aluminum, Trip computer, Transmission: 6-Speed SelectShift Automatic -inc: shifter button activation, Transmission w/Driver Selectable Mode, Tires: P235/60R18 BSW, Tailgate/Rear Door Lock Included w/Power Door Locks, Systems Monitor, SYNC w/MyFord Touch & SYNC Services -inc: Voice-activated communications and entertainment system, 911 Assist, VHR, AppLink, Bluetooth, steering wheel controls, 2 driver configurable 4.2" color LCD displays in cluster, 8" LCD color touch-screen in center, media hub w/2 USB ports, SD card reader and audio/video input jacks, SYNC Services includes traffic reports and GPS based turn-by-turn directions and information services, SYNC services receive a complimentary 3 year prepaid subscription (1 phone/primary account), and Strut Front Suspension w/Coil Springs. Stop by and visit us at Cavender Buick GMC West, 7400 West 1604 North, San Antonio, TX 78254. Come see this 2014 Ford Explorer Limited. Its Automatic transmission and Regular Unleaded V-6 3.5 L/213 engine will keep you going. This Ford Explorer has the following options: ENGINE: 3.5L TI-VCT V6, Wheels: 20" Painted Aluminum, Voice Activated Dual Zone Front Automatic Air Conditioning, Valet Function, Trip computer, Transmission: 6-Speed SelectShift Automatic, Towing Equipment -inc: Trailer Sway Control, Tires: P255/50R20 AS BSW, Tailgate/Rear Door Lock Included w/Power Door Locks, and Systems Monitor. See it for yourself at Cavender Buick GMC West, 7400 West 1604 North, San Antonio, TX 78254. Come see this 2014 Ford F-150 XLT. Its Automatic transmission and Regular Unleaded V-8 5.0 L/302 engine will keep you going. This Ford F-150 features the following options: ENGINE: 5.0L V8 FFV (STD), Wheels: 17" Machined-Aluminum w/Painted Accents, Variable intermittent wipers, Urethane Gear Shift Knob, Transmission: Electronic 6-Speed Automatic -inc: tow/haul mode, Transmission w/Oil Cooler, Towing Equipment -inc: Harness and Trailer Sway Control, Tires: P255/65R17 OWL A/S (4), Tailgate Rear Cargo Access, and SYNC Voice Activated Communication & Entertainment -inc: 911 assist and vehicle health reports, SYNC Applink provides control of certain smartphone applications using SYNC voice commands, Connect to apps like Pandora and more w/your iPhone, Blackberry or Android platform mobile phone. Stop by and visit us at Cavender Buick GMC West, 7400 West 1604 North, San Antonio, TX 78254.